If you want to know more about making money by selling scrap metal – you’ve come to the right place. The first thing you need to learn is to determine what type of metal you have before you think about anything else. Once you know what you have and how much of it you have, you will be able to get the best prices for scrap metal in Massachusetts. There are two basic types of metal – that which sticks to a magnet, and that which doesn’t. The names for these two types are ferrous metal, the magnetic type; and non-ferrous, the non-magnetic type. Ferrous metal is very common and is all around us. It is used to make cars, appliances and other types of machinery. Non-ferrous metal is also used frequently, but because it is more valuable than ferrous metals, it is usually found in smaller quantities and on the inside of appliances and machinery. Outside of using a magnet, you can also sometimes determine whether your scrap metal is ferrous or non-ferrous by looking at it to see if it is old or if there is any rust on it. 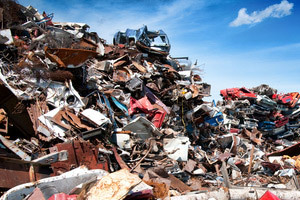 Knowing the difference between the two will help you to properly sort your scrap metal for selling and it will also help you get the best prices for scrap metal on the Cape or anywhere in Southcoast Massachusetts. Now we’ll discuss ferrous and non-ferrous metal and its applications in detail. You will find ferrous metals, which include steel and iron, in many of the appliances and machines that we use each day. Motors, farm equipment, landscaping tools and even lawn mowers will contain ferrous metal. However, lawn mowers are typically made of both ferrous and non-ferrous metals, using aluminum to reduce the weight of the machine. Aluminum is one of the most commonly used non-ferrous metals. If you are getting into collecting and selling scrap metal in Westport, Massachusetts, you will want to start carrying a magnet with you everywhere you go to help identify ferrous and non-ferrous scrap. The reason that ferrous metals are magnetic is that they contain very magnetic materials, such as iron and iron ore. A strong magnet is highly recommended because weak magnets can sometimes give “false readings” simply because they aren’t powerful enough. Some scrappers carry their magnet on a chain because the magnet will actually “pull” or “sway” when held over or near metals for quick identification. There are exceptions to the magnetic rule, which is why there is a second test to help you make the call. Stainless steel is a non-ferrous metal, however it is commonly made with iron. So, sometimes the magnet will stick to stainless steel – and sometimes it won’t. You need to learn other identifying factors to make sure you get the best prices for scrap metal in Massachusetts when you take it to your local scrap metal and salvage yard. The second test is if the metal looks old or if it has any rust on it. An old piece of ferrous metal that has been outdoors for any period of time will usually be covered in rust. Non-ferrous metals do not rust. They can oxidize, but they don’t rust. There are some quick and easy ways to identify non-ferrous metals, which include aluminum, stainless steel, copper, brass, platinum and lead. In addition to differences in color and appearance, we now know from our discussion on ferrous metals that non-ferrous metals aren’t (usually) magnetic, they don’t rust, but they can oxidize. Aluminum will oxidize more often than other types of non-ferrous metals. Because non-ferrous metals are so valuable compared to other types of scrap metal, it is important to know the laws in your area concerning the recycling or scrapping of metal that falls into this category. Copper wire and pipe are frequently stolen from homes or work sites because of their high value and there have been trends of catalytic converters being stolen from vehicles because of the high value of platinum. Because of this some states have instituted laws that require you to have proof that you had the right to sell the scrap items. If you aren’t sure, check with your local scrap metal salvage yard for instructions on the rules for selling scrap metal in Westport, Massachusetts or anywhere else in the Southcoast region. For the best prices for scrap metal in Massachusetts, visit Mid-City Scrap Iron & Salvage. Located conveniently in Westport, Mid-City services customers all throughout Southeastern Massachusetts and the Cape.